The Jacob’s Ladder team will educate residents about addiction, and their journey toward awakening. During this initial phase, residents are more restricted than in later phases and will be focusing solely on preparing themselves for a life of recovery. As they progress in their step work and treatment programs, their time spent farming will increase, as will the expectation of self-reliance and accountability. The goals in this second phase are self-acceptance, humanization, and a healthy sense of self and lovability. There is greater involvement on the farm, and greater involvement with peers. With continued progression, leadership roles are assumed within the Jacob’s Ladder community and residents act in service to others who are new to the program. The third phase is one of great excitement and action. Supervisory involvement on the farm is expected, as is peer leadership and service work with new community residents. Goals are personal accountability and motivation without prompting, and the commencement of making amends. At this time, we start discussion about relapse prevention and designing the after care plan. We understand that in active addiction our clients have lived extremely self-centered and isolated lives, depending exclusively on their own addictive reasoning and skewed beliefs. We know that this sense of dis-ease, shame and alienation is the driving agent in the addictive process. 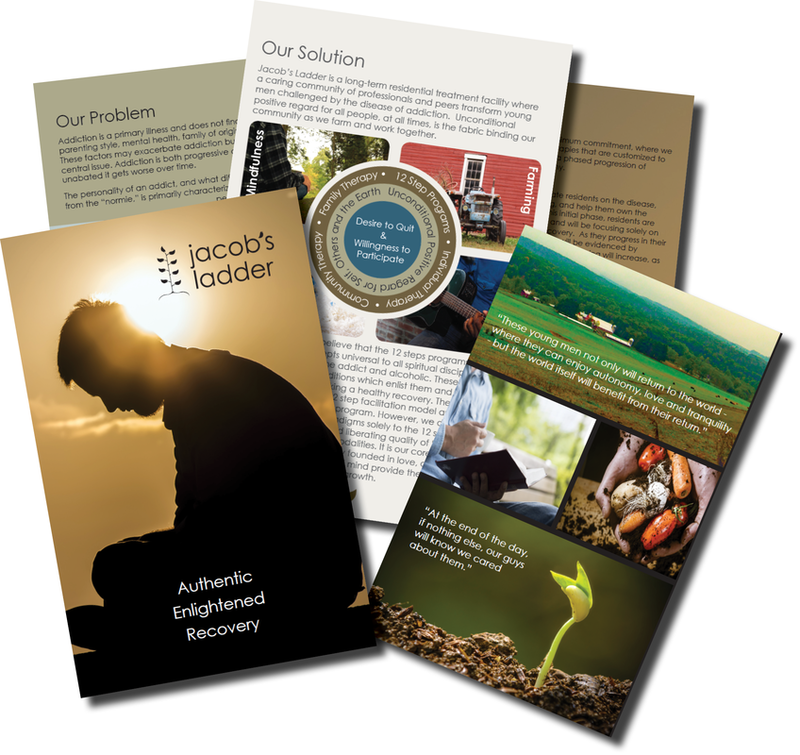 The Jacob's Ladder community is grounded in the belief that an atmosphere of authentic love, and unconditional positive regard is not simply a cliché, but rather, the curative essence in holistic addiction treatment. Therefore, we emphasize our agrarian, therapeutic model as a means of helping our clients find meaningful and lasting connections with their peers, their Higher Powers and themselves. 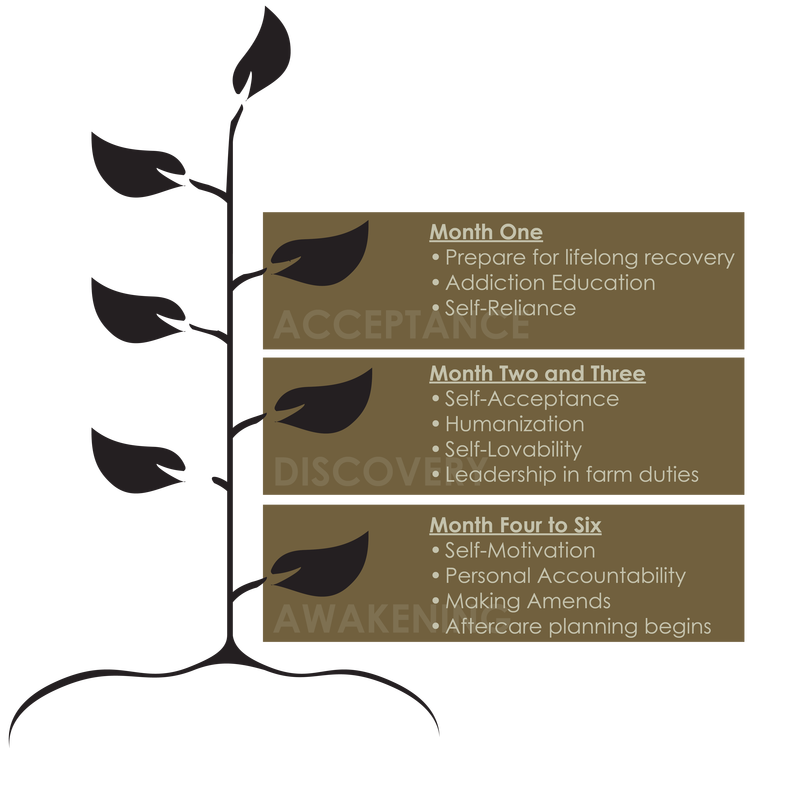 Our holistic addiction treatment program facilitates proven models that are customized to the needs of the individual through a phased progression of increasing autonomy. We complement the clinical and psychological aspects of the holistic addiction treatment program with music and arts programs as well as the best wilderness adventure therapy, while immersed in a farming community where everyone is focused on maintaining an unconditional positive regard for self, others and the earth. Our clients will share in both household and farming obligations as a part of our mindfulness and farm rehab therapy. Everyone is expected to make their bed, clean, complete daily chores, participate in meal preparation , and assist with outdoor cleanup as well.